With a background in Art, Ruth Lee trained as a French Polisher at The Midland School of French Polishing, worked with an antique restoration company, and then formed Little Brown Mouse Furniture Restoration & French Polishing in 2001. 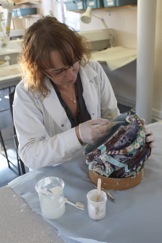 She subsequently qualified as a conservator, with a BA Honours degree in Conservation and Restoration from The University of Lincoln, specialising in ceramics and gilding. Ruth works to conservation standards, and maintains the same care, whether it is for a private client, collector, stately home or museum. 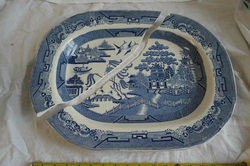 All ceramic items and furniture are assessed before treatment commences, and an appropriate treatment plan is agreed with the client. It is not necessary for your china or furniture to be an antique. Many items hold sentimental attachments and as such are normally worth restoring. Quotes are free within a reasonable traveling distance, and work is carried out to a professional high standard with affordable prices.